How Does It Relate To Tendonitis? Shoulder Impingement is classified as a medical problem. It has it's own diagnosis, and diagnosis code. If you have a diagnosis of impingement, or are concerned that there is impingement of the shoulder happening, it is good to have a full idea of what that means. There is a lot of information on the internet about this, and there is something important that is missing from all of it. "Impingement is one of the most common causes of pain in the adult shoulder. It results from pressure on the rotator cuff from part of the shoulder blade (scapula) as the arm is lifted." In and of itself, that is true. However the definition is not complete. It is a rather worthless definition due to what is missing. Western medicine operates from this definition and mindset. Which is a problem, because as is normal for western medicine, when it tries to fix the problem it really is just trying to alleviate a symptom. Said another way, it deals with that there is 'pressure' but doesn't deal with the cause of the pressure. So, what is Shoulder Impingement? What causes the pressure? Why is there an impingement? It doesn't just show up out of the blue. "Shoulder Impingement is a compression of the shoulder structure caused by muscles that are chronically too tight. Because the muscles are too tight, the structure can not move freely because the structures are pulled too tightly together. This causes compression, grinding, extra friction, and various other strains to various tissues like connective tissue and bursa." 1. Over time with use, muscles of the neck, shoulder, chest, and arm slowly get tighter and tighter. Tighter becomes the new normal. 2. As muscles get tighter they put more tension and pull on their connections. If their tendons cross a joint, they pull bones together and compress the joint. 3. As things get tighter and more compressed, and you use your arm/shoulder, this compression tells the nervous system there is a problem. 4. The nervous system tries to protect you by tightening muscles to 'guard' you. Shoulder Impingement is a process. It is what happens towards the end of an Impingement dynamic. And it shares EVERY SINGLE factor that makes up the Tendonitis dynamic. See: What Is Tendonitis? to understand the how and why of the Tendonitis dynamic. Impingement does not just show up out of the blue. It is not a disease. There is nothing mysterious about it's arrival. So how do you make it better? Make the muscles looser. Make the connective tissue looser. Relax the nervous system. Use skilled massage, exercise, gentle stretching and a lot of it, meditation. That is a very vague explanation of how to reverse the process, but the key is knowing that it is a process, that it is primarily started and continued by too tight muscles. So what role does Tendonitis play with shoulder impingement? You can have shoulder impingement with Shoulder Tendonitis or without it. The dynamic of Tendonitis very closely follows the impingement dynamic, except that with Tendonitis there is actual damage to a tendon, and even more Inflammation. Muscles get tight, you use them, they get tighter, too tight. Then there is some irritation and micro-damage to the tendon, and then nervous system tries to protect you by making things more tight. Actual damage can speed up the tightness that causes the compression that causes shoulder impingement problems. Let me know if this is too short and simple of an explanation. Muscle tightness causes Shoulder Impingement. The presence of Tendonitis in the shoulder can cause muscle tightness faster, and creates an ecology where there is more pain, and longer lasting pain and tightness. "How do I treat shoulder impingement?" Surgeons want to cut into the top of your shoulder and remove the 'impinged' area, and/or cut tendon and connective tissue to 'free' the impingement. But they never ask WHY you have an impingement in the first place. If you're facing shoulder impingement surgery, here are some good questions to ask: Quiz Your Doctor. Because you want to MAKE SURE that the surgery has a chance of fixing the problem. To successfully treat impingement of the shoulder, you have to effectively reverse the causes, the factors CAUSING the problem. SOMETHING is causing the compression. 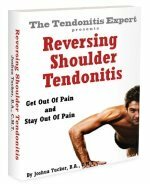 Find out what the primary cause of shoulder impingement is and how to quickly reverse it in the Reversing Shoulder Tendonitis ebook. Return to the top of this Shoulder Impingement and Tendonitis page.